Your dad is special—of course, he’s YOUR dad! He raised you and supported you throughout your life, making you the person you are today. We know it can be challenging to come up with unique ways to spend Father’s Day year after year. 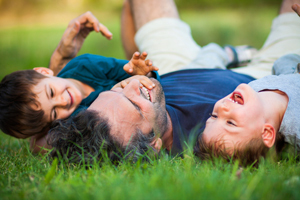 Don’t get caught up with complicated plans or expensive gifts – what dad wants most is to spend time with his kids. Give him what he really wants by taking him for a gelato break this Father’s Day weekend. This month, enjoy a special on Café Latte Crepes & Gelato! International Love – Tell dad “ti amo” before taking him for a scoop of gelato! Gelato is the Italian word for ice cream. Some people claim there is no difference between gelato and ice cream. If you have ever had gelato, however, you know that the fresh taste and range of flavours make it much different from traditional ice cream. Enlighten dad to the difference or help him relive his trip to Italy with a post-dinner dessert from Crepe Delicious. Healthier Option – If you are concerned about dad’s health as he gets older, but still want to indulge him on his special day, gelato is the perfect treat! Gelato is a healthy alternative to ice cream, as it is made with milk which contains much less fat than mass-produced alternatives made with cream. You’ll both finish your scoops feeling satisfied without the heavy, full feeling many ice creams cause. Something for Everyone – Whether you are an only child or you will be celebrating dad with your siblings, Crepe Delicious offers a wide variety of gelato flavours to satisfy everyone’s preferences and cravings. You can also extend your dessert visit to a full meal with our varied menu of crepes. Dad can stick to classics like Chocolate or Strawberry, or mix things up with new favourites such as Salted Caramel and Birthday Cake. Savings, dessert, and time with the people he loves most will leave dad with a big smile and fond memories to cherish! Treat your father to something special this Father’s Day with the wide variety of fresh, authentic gelatos and sorbets at Crepe Delicious. Check out our menu and find a location near you to try your favourite flavour.